The USNS Mary Sears, searching off the western coast of Sulawesi island, has detected what the US Navy believes to be signals from the cockpit voice and flight data recorders of Adam Air flight 574. The aircraft went missing with 102 people aboard on New Year's Day enroute to Manado in northern Sulawesi from Surabaya in East Java. "During the search of the projected crash site of Adam Air Flight 574, the Mary Sears, using a Towed Pinger Locator, detected pingers on the same frequency of the black box associated with the missing airplane," the US embassy said in a prepared statement. 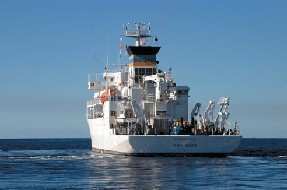 The USNS Mary Sears is one of several specialized oceanographic research ships operated by the Naval Meteorology and Oceanography Command of the US Navy. Pieces of wreckage from the 737-400 have turned up over the past weeks in the area where the Mary Sears' crew detected the signals, but so far none have provided clues to determine what happened to the jet. A Singaporean team searched for the Boeing's recorders, but gave up and returned home earlier this week. Investigators hope finding the black box will lead to finding major portions of the aircraft and an understanding of its fate. US Navy officials say the USNS Mary Sears has found "heavy debris" scattered over a wide area near where the signals were detected, and is analyzing the data. The US Embassy said it's passed all the information to Indonesian authorities and the USNS Mary Sears will be leaving the area on Friday. Indonesia's search and rescue agency said its efforts to locate the downed jet were hampered by the depth of the ocean in the area, known as the Makassar Strait. Flight recorders are capable of transmitting a locator signal for up to 30 days to help searchers find them, but the water in the Makassar Strait can be deep as 6,000 feet.